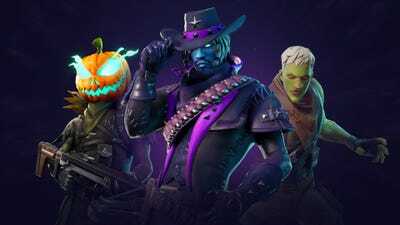 ‘Fortnite’/Epic gamesThe ‘Fortnite’ Halloween event, Fortnitemares, is back for 2018. 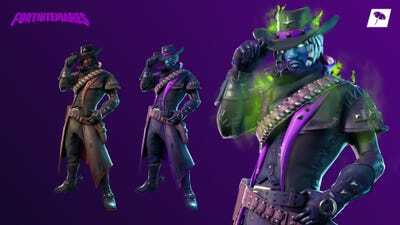 Fortnitemares introduces challenges for players that unlock Halloween-themed items in both the “Battle Royale” and “Save the World” game modes. Along with the return of Fortnitemares, the latest update will bring general improvements to both modes of the game. “Fortnite: Save the World” is also on sale for 50% off through November 6th. The world of “Fortnite” is getting a spooky makeover with the return of Fortnitemares, a Halloween-themed special event that began on Wednesday. As a part of Fortnitemares, cube fragments in “Fortnite: Battle Royale” will spawn cube monsters that drop loot and grant players extra shield when they’re killed. Destroying cube monsters is one of several new challenges linked to the event, and will help unlock some of the limited-time Halloween content. The most sought-after addition will be the new Deadfire outfit, which will change form mid-match based on player performance. As the player racks up damage and survives during battle royales, Deadfire will shift in appearance from a mortal man to a sinister spectre. The Deadfire outfit has matching cosmetic items, too: a pickaxe called the “Dark Shard,” and the Shackled Stone Back Bling, a backpack that goes along with the outfit. ‘Fortnite’/Epic GamesFortnitemares 2018 will add the Deadfire outfit. Other major additions to “Fortnite: Battle Royale” include the six shooter – a high calibre pistol – and the ability to redeploy the glider that drops players into the game at the start. Previously, players would need an item called the launch pad to re-use their glider, but now gliders can be used when jumping from a height of three stories or higher. You can check out the full list of improvements to the “Battle Royale” mode with the Fortnitemares patch notes. Fortnitemares also includes additions to “Fortnite: Save the World,” the paid mode of the game. Players will see the return of Hexsylvania, a special zone with an exclusive quest line, or set of objectives, called Vlad Moon Rising. The quest line has been upgraded with new narrative content, and all seven event-specific heroes from last year’s Fortnitemares event can be unlocked once again. Players can complete quests to unlock the heroes and other Fortnitemares rewards. “Save the World,” will also be on sale for 50% off through November 6th for players who haven’t purchased the “Fortnite” campaign mode. Fortnitemares has already begun, but it’s a limited-time event. The special rewards included will only be available for a few weeks.